The scope and pace of such cybersecurity threats would rise with every passing year, and with this rise, more certified cybersecurity experts and professionals would be needed by every corporate and organisation to prevent themselves from hackers and cyber thieves. That’s why jobs in the cybersecurity field have gone up 80 percent over the past three years than any other IT-related job. So, this is the right time for you to consider a new career as a cybersecurity professional. 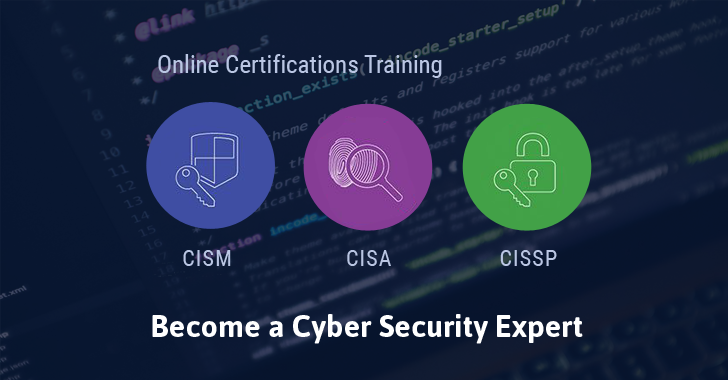 But before getting started, you need to gain some valuable cyber security certifications that not only boost your skills but also verify your knowledge and credibility as a cybersecurity expert. THN Deals Store this week brings you the Cybersecurity Certification Mega Bundle, which will help you master three elite cybersecurity certification exams—CISA, CISM, and CISSP. This online training course provides you with the best-selling study materials to pass the CISA, CISM, and CISSP certification exams. It dives deep into the most proven and practical methods for protecting vulnerable networks in any business environment. From the fundamentals of cryptography and encryption to the security holes in computer networks and mobile apps, this online course will help you learn about information security audits, assurance, guidelines, standards, and best cybersecurity practices in the industry. At the end of this course, you would develop the expertise to manage, design, oversee, and assess an enterprise’s information security, as well as maintain a secure business environment using globally approved Information Security standards. If you do not know what CISA, CISM, and CISSP certifications are, below, you can find brief information about the courses and their importance in the IT industry. The CISA certification is renowned across the world as the standard of achievement for those who audit, monitor, access and control information technology and business systems. Being CISA-certified showcases candidates for their audit experience, skills, and knowledge, and signifies that you are an expert in managing vulnerabilities, instituting controls and ensuring compliance within the enterprise. The demand for skilled information security managers is on the rise, and CISM is the globally accepted certification standard of achievement in this area. The uniquely management-focused CISM certification ensures you are re-equipped with the best practices in the IT industry and recognises your expertise to manage, design, and oversee and assess an enterprise’s information security. The CISSP certification is a globally-recognised certification in the field of information security and has become a standard of achievement that is acknowledged worldwide. Offered by the International Information Systems Security Certification Consortium, commonly known as (ISC)², CISSP is an objective measure of excellence, which requires a broad level of knowledge. If you want to select the best and cost-efficient course to pass CISA, CISM, and CISSP certifications, the Cybersecurity Certification Mega Bundle course is the one for you to begin with. You can get Cybersecurity Certification Mega Bundle for just $69 (after 93% discount) at the THN Deals Store. So, to Sign-up for the Cybersecurity Certification Mega Bundle course, click on this link and get your online course now. Buying this course will not be a wrong decision. In case, you are not satisfied with this course for any reason, our training partner also provides a 15-day money back guarantee and will issue a refund. So, what you are now waiting for? Grab the course Now!